Not too many days after showing off his “bulging muscles and colorful tattoos” on a hike with his sister, actor Colin Farrell decided to fuel up his body with some Whole Foods in Tarzana. The photo information for the following picture on my Samsung Galaxy SIII reads: 20130724_203233-1. So it was taken on July 24th 2013 qt 8:32pm and 33-seconds. The -1 means it is a crop of the original photo which is at the end of this blog. Most likely because I am so self-centered, I found it difficult to recall his name when I ran into Colin Farrell in Whole Foods Market in Tarzana, California on July 24th 2013. But I definitely recognized him and thought that he might be one of the many thousands of people I meet and greet on my adventures every month. At first I thought he might be one of the many good-looking actors and models who I get to train from time to time in group classes or privately. He looked so familiar. It bugs me a lot because it happens often. Being so consumed with my own thoughts, ambitions, goals, plans and schemes I find it difficult to recall certain details at times. So I did not realize that it was just an artifact of mind and memory that classifies actual physical encounters, imagined encounters and multi-media encounters the same way: EXPERIENCE. But being a blogger who always wants to make sure I have some good media for you to interact with, I made sure I got myself a photo just to be safe. Something in me soon began to realize that Colin Farrell was a bit out of place in Whole Foods. I think it was the accent. I did not know anyone who sounded like that. So the next time we passed each other, I uttered the secret pass-code that gets me celebrity photos on the spot every time and he got into gangsta-pose with me and snapped a shot. I thanked him and went along my way to finish up with my collection of gourmet sandwiches, bananas, and 365 bottled water. And since Molly knew I had her e mail on file she kindly asked me to send her a copy which I did almost immediately. It seems like I really need to work on this name to face recognition skill. It may come in handy. I do not want to miss out on the opportunity to please the fans. People like to know their favorite celebrities are visiting their home-town and even shopping in their local market. 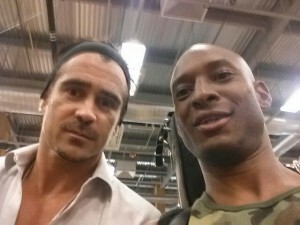 You never know when you will run into Colin Farrell at Whole Foods.